Recently returning from Israel as part of the Schultz Family Israel Educational Leadership Fellows program were: front row from left, Peta Silansky (Jewish Federation of Greater Dallas), Lisa Kramer Morgan (Akiba Academy), Andi Bonner (Akiba Academy), Pam Karpel (Levine Academy), Adriana Meyerovitz (Akiba Academy) and Dafna Rubinstein (JCC Dallas); back row, Ari Bar-Ilan (tour educator, Giant Leaps), Dani Meyerovitz (Akiba Academy), Dan Tatar (iCenter), Josh Goldstein (JCC Dallas), Daniel Taylor (JCC Dallas), Lynda McInnes (Levine Academy), Julie Wilkofsky (Levine Academy), Yael Twito (Levine Academy) and Tara Ohayon (JCC Dallas). The Schultz Family Israel Educational Leadership Fellows latest cohort recently returned from a 10-day immersive Israel experience Oct. 8-18. This fourth cohort of Schultz Fellows — a program of the Jewish Federation of Greater Dallas’ Center for Jewish Education — includes a combination of administrators, faculty members and lay leaders from Akiba Academy of Dallas, Ann & Nate Levine Academy and the Aaron Family JCC. Representing Akiba are Andi Bonner, Adriana Meyerovitz, Dani Meyerovitz and Lisa Kramer Morgan. Levine educators are Pam Karpel, Lynda McInnes, Yael Twito and Julie Wilkofsky. The JCC sent Josh Goldstein, Tara Ohayon, Dafna Rubenstein and Daniel Taylor. In addition, Dan Tatar of the iCenter and Peta Silansky of the Federation participated. The opening ceremony in Israel allowed the Fellows to leave the hustle and bustle of their daily lives back home, immerse themselves in the experience, mark the importance of the next few days in Israel and sanctify the moment for themselves and in memory of visionary philanthropist Leslie Schultz, of blessed memory. The group prepared for several months by exploring the culture of Israel education and the infusion of Israel throughout their institution’s learning environment through shared cultural values. The Israel experience mirrored their learning and provided an opportunity for the Fellows to gain insights and varied perspectives of Israel. Thoughtful relationships were formed as they connected with educational leaders in Dallas’s Partnership Region of the Western Galilee. The programming and speakers motivated and inspired the group with their educational strategies and value-based initiatives, which are being implemented daily to motivate and guide their youth. The Fellows delved into the question of how you effectively and responsibly share diverse narratives and perspectives with our learners. “You can’t put your heart in Israel until you put your feet in Israel,” Morgan said. Exploring communal and individual values was enhanced by meeting former NCAA and Israeli professional basketball star Tamir Goodman. He shared and introduced his vision of engaging Jewish youth through sports. He talked about how keeping his dedication to his values was a priority throughout his career. Leading by example, staying true to core values and overcoming obstacles are just a few of the lessons learned by this group of leaders. For more information about the Schultz Fellows, contact Silansky psilansky@jewishdallas.org. 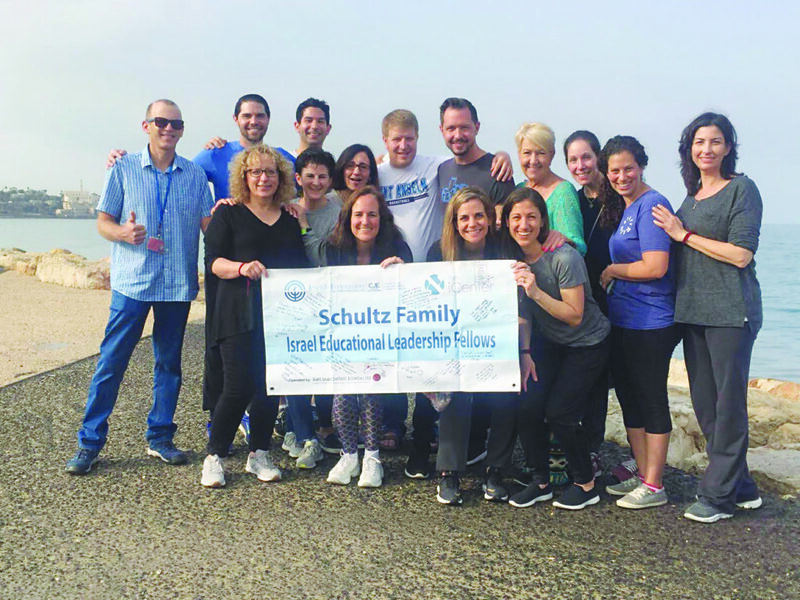 The Schultz Family Israel Educational Leadership Fellows is made possible by the Schultz Family Foundation. Dallas Chapter of Hadassah will present a program at 10:30 a.m. Monday, Dec. 10, to learn about miracles created through the collaboration of Hebrew University and Hadassah. Guest speaker is Ambassador Yossi Dahl, Hebrew University vice president of advancement and external relations. Games, songs, door prizes and Hanukkah snacks will be featured. The chapter will install its 2019 board and present the Sarah Mendel Susman Award from 7 to 9 p.m. Thursday, Dec.13, at The Bonaventure, 5200 Keller Springs Road. Incoming president is Elise Power. Contact chapter.dallas@hadassah.org or 214-691-1948 to RSVP or for information on either event or for a ride to the events.